Is a QE exit really scary? 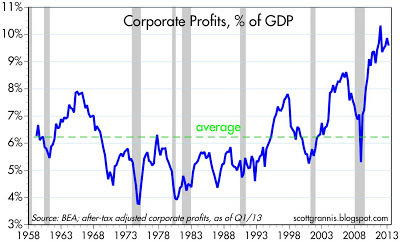 With yesterday's release of revisions to first quarter GDP we got a first look at corporate profits. Although after-tax profits slipped 2% from the prior quarter, they grew 6.1% over the past year and remain very high relative to nominal GDP. Despite the impressive performance of profits in recent years, the market remains skeptical about the future. 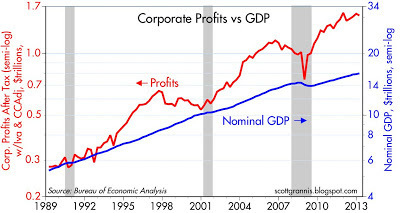 The two charts above compare the National Income and Product Accounts measure of after-tax corporate profits to nominal GDP over different time horizons. 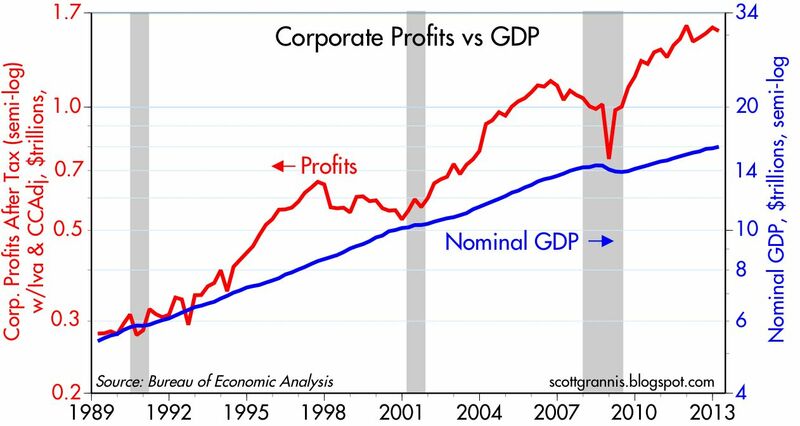 Although the growth of corporate profits has slowed in recent years, profits are at or near all-time high levels, both nominally and relative to GDP, with the latter comparison shown in the chart below. 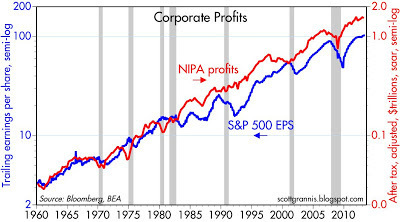 In the past 55 years we have never seen such a strong period of profits growth as we have in this recovery. 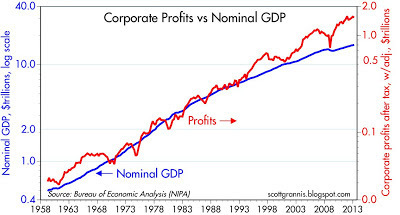 The fact that corporate profits have tended to track nominal GDP over time is not unusual, but the degree to which profits have outperformed nominal GDP in recent years is exceptional. 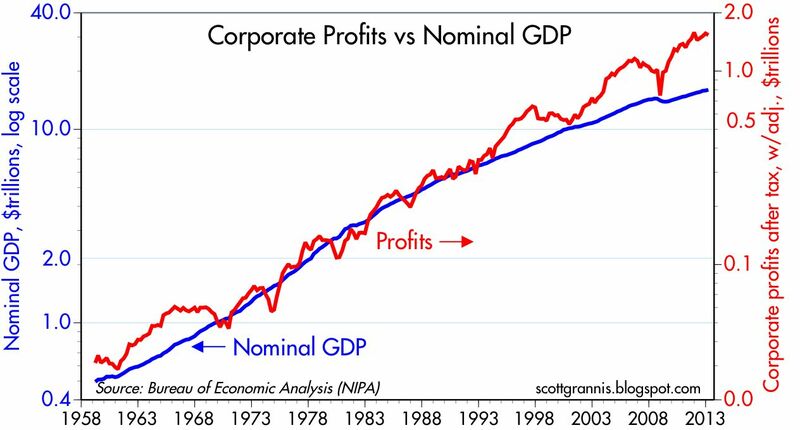 I've argued for a long time that the market looks at the first chart above and sees a compelling case for corporate profits to revert to their long-term mean (just above 6% of nominal GDP). That would of course imply either a huge decline in profits in the next few years, or an extended period of flat profits, and that helps explain why the market is reluctant to embrace equities. 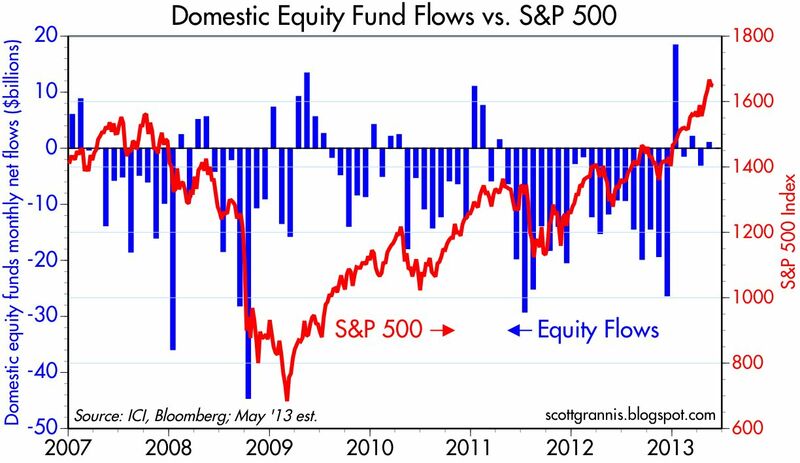 As the second chart above shows, equity flows have been strongly negative for the past six years, even as corporate profits have surged. In short, the market has been behaving as if it were highly skeptical of the durability of corporate profits. The charts above represent two different ways to judge the valuation of the equity market, both using a ratio of equity prices to earnings. To construct these PE ratios I've used the S&P 500 index as the basis for the "P." In the first chart I've used the NIPA measure of after-tax corporate profits for the "E", and in the second chart I've used the traditional measure of 4-quarter trailing earnings per share for the "E." Both show similar patterns, and between the two of them they suggest that equity valuations are either very attractive (i.e., very low relative to the long-term average), or about fairly valued (i.e., approximately equal to their long-term average). One thing for sure: there is no sign here of any irrational exuberance. 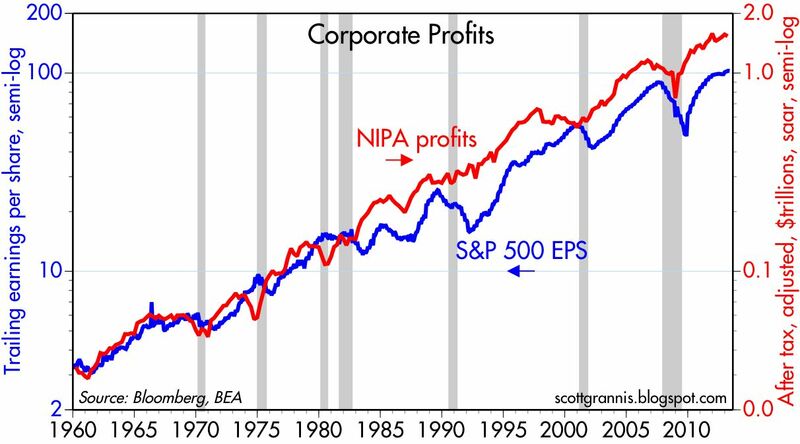 The above chart compares these two measures of corporate profits. 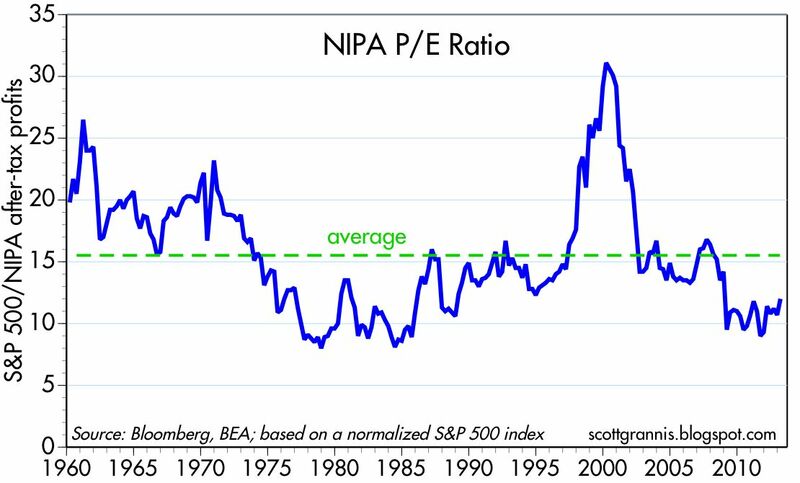 Again, very similar, though NIPA profits have grown somewhat faster than S&P 500 earnings per share in the past 30 years and they have been less volatile. 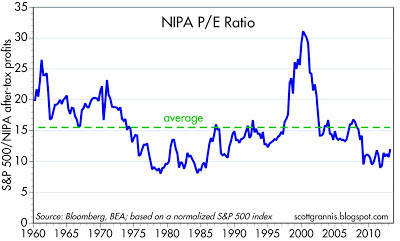 I note that NIPA profits tend to lead EPS, and one reason is that NIPA profits are quarterly annualized numbers whereas EPS are 4-quarter trailing profits, so NIPA profits are more contemporaneous. Another reason for the different levels of the two profits measures is that NIPA profits are based on IRS returns, and do not include things such as write-offs that can depress reported EPS. The recent growth of profits by either measure is modest, and it's tempting to think profits might "roll over" in the next year or two. That's what I think the market is already pricing in: a period of very weak growth or the possibility of a recession. 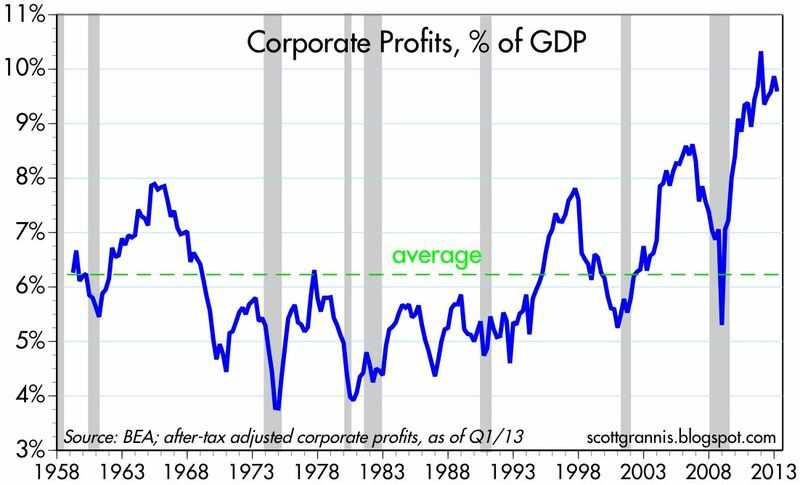 As a counterpoint to the view that profits are so high relative to GDP that they are very likely to revert to the mean, I offer the chart above. 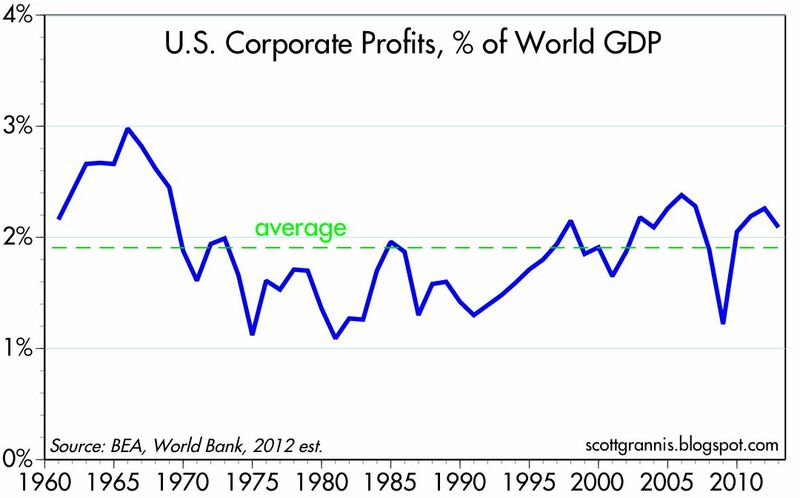 This shows that corporate profits are not very high at all when compared to global GDP. Global GDP has grown much faster than U.S. GDP in the past decade, and global sales have become an increasingly important source for the profits of U.S. corporations. 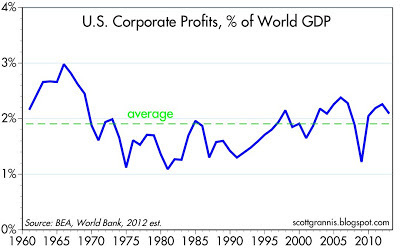 So while profits look unsustainably high relative to U.S. GDP, it may simply be the case that, thanks to strong global growth which has greatly expanded the market for U.S.-based corporations, profits are going to move to a new high level relative to U.S. GDP—in other words, the mean is going to shift up permanently. The world has undergone fundamental and significant changes in the past decade, so U.S.-based metrics have become less relevant. 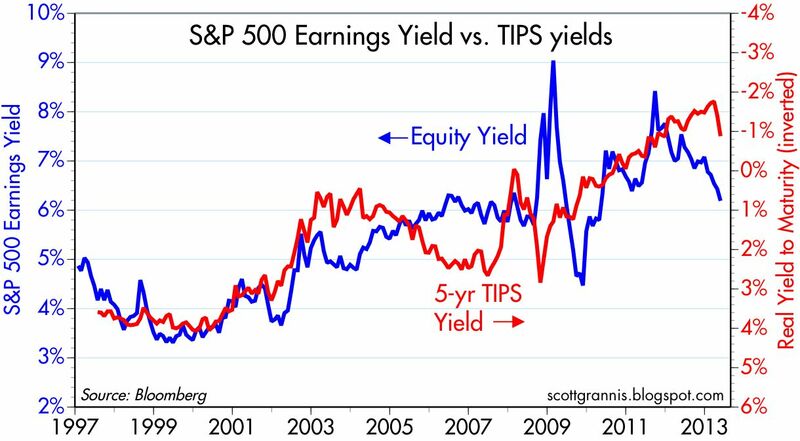 The chart above compares the earnings yield on the S&P 500 (the inverse of the PE ratio) to the real yield on 5-yr TIPS (inverted). The point here is to tie together the messages embedded in stock and bond prices. I think these two series track each other over time because they both reflect the market's confidence in the future health of the economy. When real yields were very high in the late 1990s, equity yields were very low; both were consistent with a market that had a high degree of confidence in the ability of the economy to grow and corporate profits to prosper. Currently, real yields are very low (though they have jumped quite a bit in the past two months) because the market worries that economic growth will be weak, and earnings yields are relatively high because the market worries that corporate profits growth will be disappointing. In short, both tell the same story: the market today is not optimistic at all about what the future holds in store for profits or for economic growth. The chart above is another method of judging the valuation of equities. It subtracts the 10-yr Treasury yield from the earnings yield of the S&P 500. 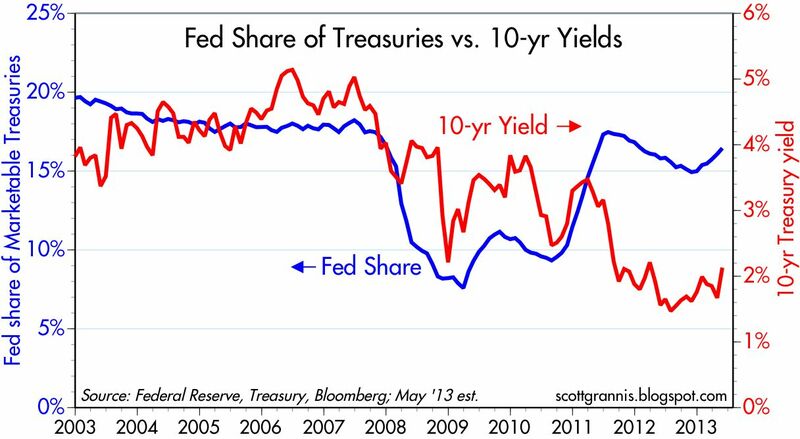 That gives you the extra yield that investors demand in order to hold equities instead of the safer 10-yr Treasury. 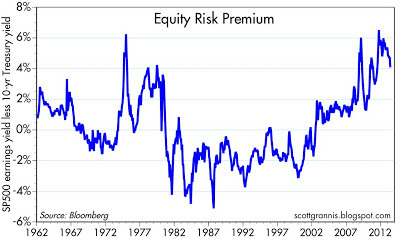 The higher the equity risk premium, the riskier stocks are perceived to be. 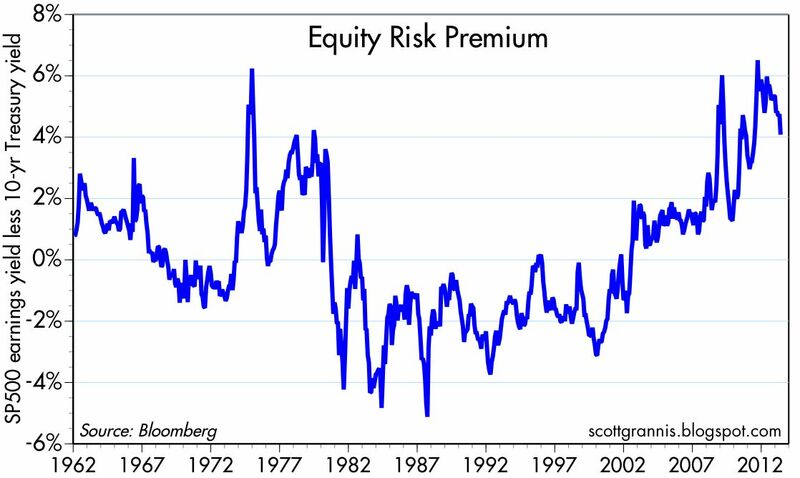 As the chart suggests, the market believes that equities are unusually risky at this time. That fits with my observations above that the market appears to be very worried that earnings are headed for an extended period of weakness. Now, the market may well prove to be correct, and corporate profits and the economy could tank in the next few years. 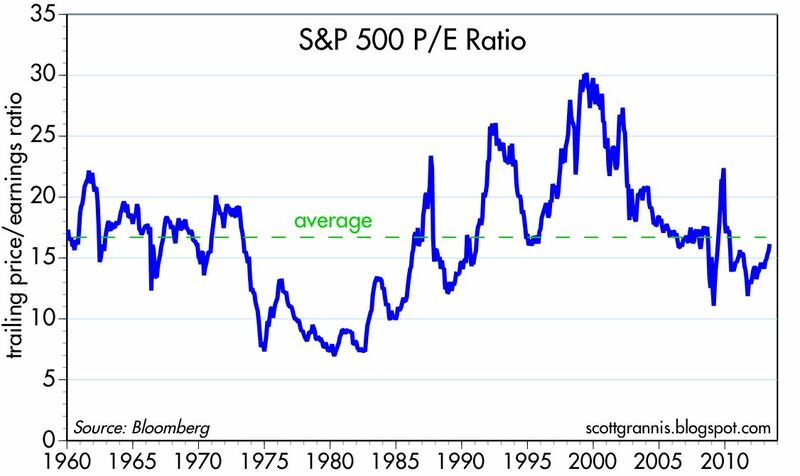 But to a great extent, that is what the market is priced to. If profits fail to tank and the economy fails to suffer another recession—even if the economy only manages to grow at 2% a year—the market may have to reprice upwards because the future will not turn out to be as bad as is currently expected. Avoiding a recession is all that matters. Long-time readers will know that this is the same story I've been telling for the past four years. The market has consistently underestimated the economy and corporate profits; the rally in equity prices has therefore been a reluctant rally, climbing walls of worry. I don't see a reason to think that anything has changed. If the Fed bought three quarters of the new issuance of Treasury securities over an 8-month period, with a focus on longer maturities, the 10-yr Treasury yield would almost certainly fall, right? 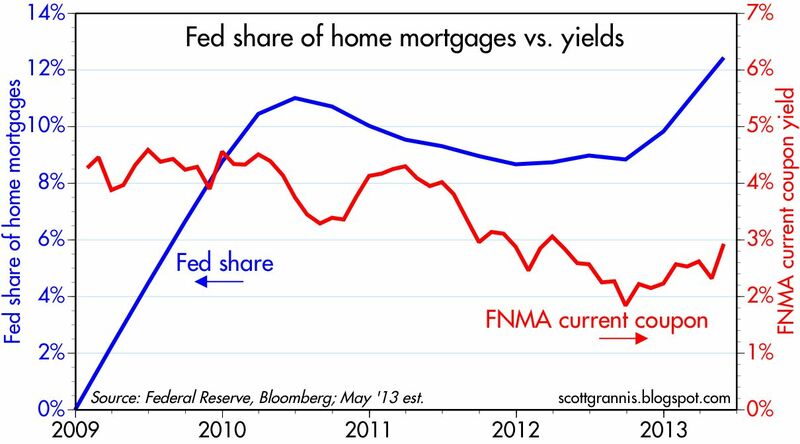 And if the Fed bought all the new issuance of MBS over an 8-month period, increasing its share of home mortgages by over 40% in the process, yields on MBS would almost certainly fall, right? Wrong. The Fed has indeed been a huge buyer of Treasuries and MBS since last September, but Treasury yields and MBS yields have moved significantly higher, not lower. What we've witnessed over the past 8 months—the duration so far of the Fed's Quantitative Easing Part 3—is almost a laboratory experiment designed to discover which is the more important determinant of longer-term interest rates: the market's willingness to hold the existing stock of bonds, or the actions of a very large purchaser of bonds on the margin (i.e., the stock vs. flow argument). It's my impression that most market participants have been persuaded by the flow argument: namely, that the Fed's massive QE3 purchases have artificially depressed market interest rates. After all, that's been the Fed's stated intention: to buy lots of bonds in order to depress interest rates and thereby stimulate borrowing and economic activity. This line of reasoning says that the fact that 10-yr Treasury yields averaged an exceptionally low 1.75% over the past year has nothing to do with the market's view of inflation or economic growth; Treasury yields have in fact become meaningless inputs to valuation models and offer no insight into market and economic fundamentals, other than as a distorting influence. I've argued to the contrary on many occasions over the years. I believe that interest rates are determined by the market's willingness to hold the existing stock of bonds, especially since Fed purchases on the margin represent only a small fraction of the existing stock. 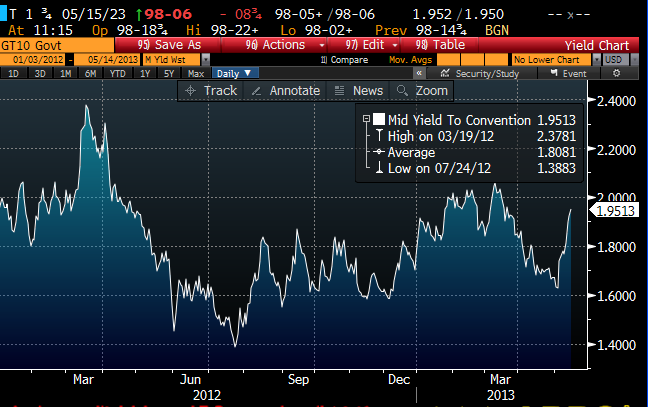 I think the Fed can only influence yields to the extent that the market's view of the economy is similar to the Fed's. If both expect the economy to be very weak, yields will be low, and prices will behave as if Fed purchases of bonds to stimulate the economy are in fact achieving their stated objective. But if the market thinks the economy is improving and/or inflation is rising, then no amount of Fed purchases will be able to keep yields from rising. That's the situation today, and it's been unfolding (in fits and starts) almost from the day QE3 began. Since last September, when the Fed announced it would begin buying $40 billion per month of MBS, the Fed's holdings of MBS have increased by about $330 billion, and that means the Fed has essentially purchased all of the new MBS issuance since last September. As the chart above shows, the Fed now owns over 12% of all home mortgages, up from less than 9% at the end of last September. 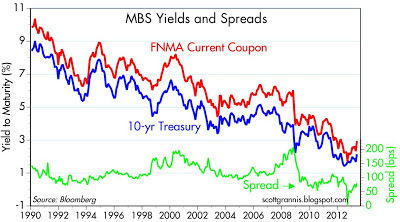 Yet despite these massive purchases, the yields on MBS have increased by over 100 bps! When QE3 was first announced in late September, MBS spreads briefly plunged to almost zero as market participants attempted to "front-run" Fed purchases. But since then they have widened to almost 80 bps, not too far from their 30-year historical median of 114 bps. 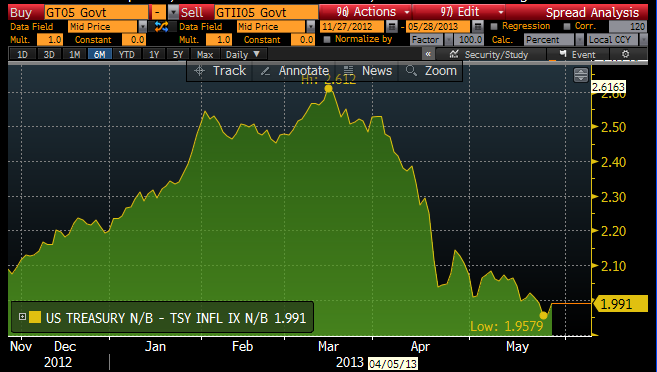 The MBS market was briefly distorted by QE3, but it is now behaving more normally. Since last September, the Fed has been buying about $45 billion of Treasuries notes and bonds per month, and that adds up to almost 75% of the federal budget deficit over the same period. These purchases have boosted the Fed's holdings of marketable Treasuries from 15.3% of marketable Treasuries to about 16.5%, as the chart above shows, but that is still a relatively small fraction of the outstanding stock of Treasuries. Despite the Fed's massive purchases, 10-yr Treasury yields are up over 50 bps since last September. 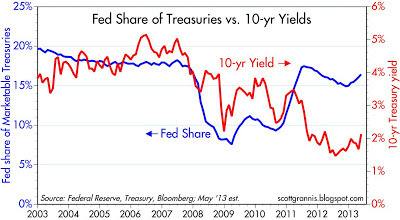 I would further note that if Fed purchases of Treasuries were a significant factor in driving yields, then the blue and red lines in the above chart should have a strong tendency to move in opposite directions (e.g., large purchases would increase the Fed's share of marketable Treasuries and would tend to depress yields). But for most of the past 10 years these lines have tended to move together; they only moved in opposite directions in the second quarter of 2008 and 2011. As I explained a few weeks ago, when central bank purchases produce counter-intuitive results, it's a good indication that the economy is perking up. 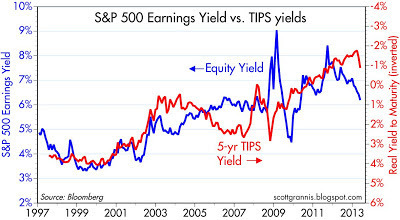 Yesterday I made that same case in reference to the even bigger increase we have seen in real yields on TIPS. Higher real and nominal yields are telling us that the market's outlook for economic growth is improving, while at the same time inflation expectations are moderating. If Fed purchases were artificially pumping up the economy, then we should have seen rising inflation expectations, lower real yields, and higher gold prices. Of course, many observers will be quick to object that yields are up because the Fed has been actively dropping hints that it may taper its QE3 purchases somewhat earlier than expected, and this has caught the market by surprise. But the fact remains that the Fed is still a large purchaser of Treasuries and MBS, and their prices are still falling. My interpretation is that the market hears the Fed hints of an early QE3 tapering and concludes that it is reasonable for the Fed to end QE3 sooner than expected, because the economy outlook is improving, however marginal that improvement might be. As I've mentioned quite a few times before, avoiding a recession is all that matters for investors when short-term interest rates are virtually zero. 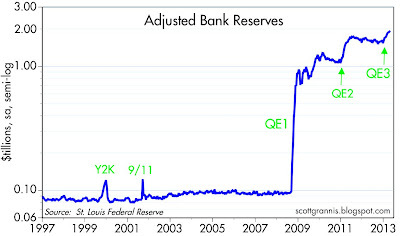 To sum up, I believe the history of QE3 shows us that the Fed cannot manipulate longer-term interest rates. Yields are fundamentally determined by the market's perception of the prospects for inflation and economic growth, not by Fed purchases of Treasuries and MBS. Since the beginning of April, real yields have soared, in what is now the biggest change on the margin to be found in the stock and bond markets. 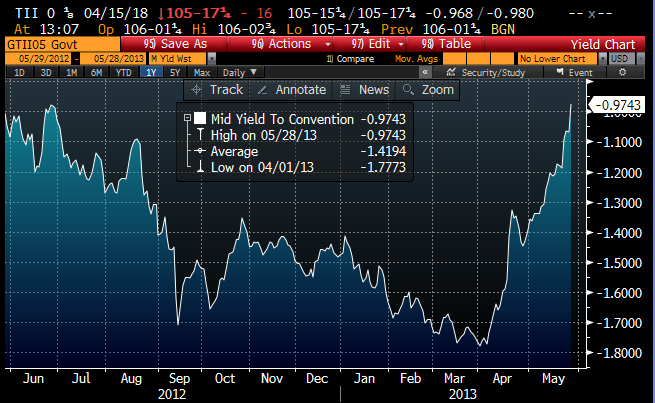 The chart above shows the real yield on 5-yr TIPS, which is up 80 bps since early last month. This measure of real yields is now at its highest level since early 2012. 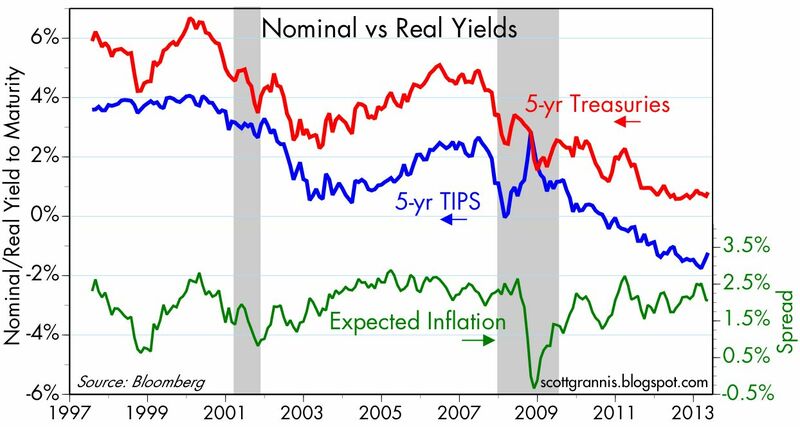 At the very least, a big increase in real yields on TIPS (which is the flip side of a big decline in TIPS prices) is consistent with a big decline in the demand for the inflation-hedging properties of TIPS. 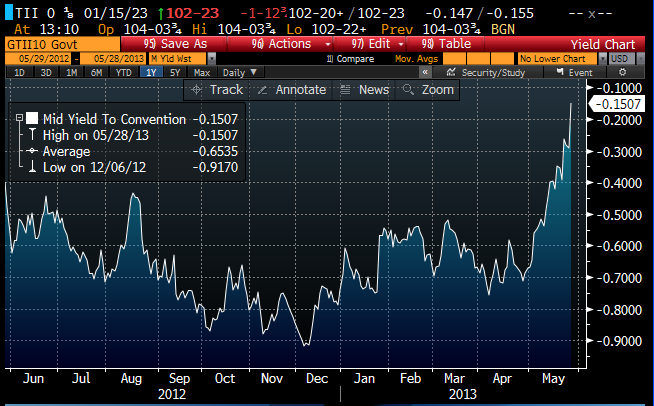 Real yields on 10-yr TIPS are up 60 bps from their early-April levels. 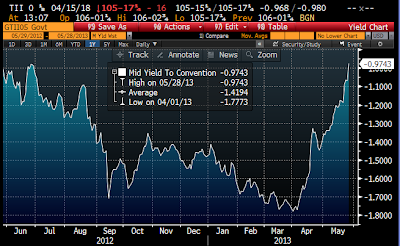 This is an across-the-board increase in real yields. As the above chart suggests, higher real yields on TIPS are likely driven by improving expectations of future economic growth. The rise in real yields also correlates to increasing hints from the FOMC that an end to Quantitative Easing may be coming sooner than the market had expected. 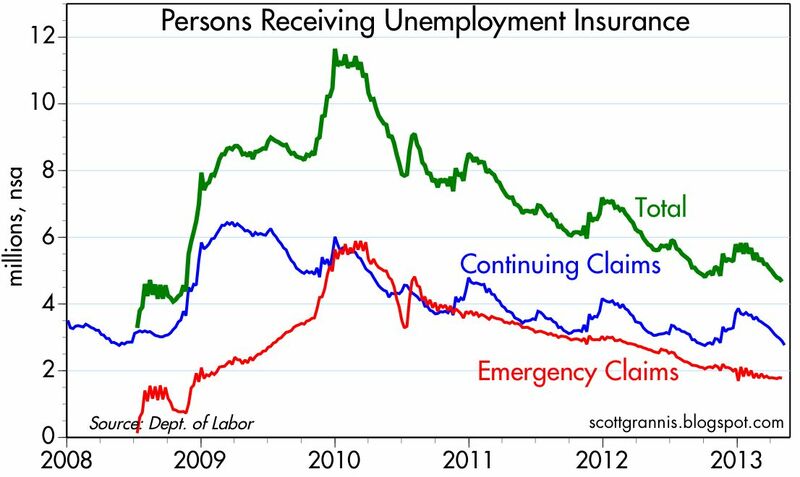 But if the Fed is likely to move sooner than expected, the underlying reason is most likely an improving economy. 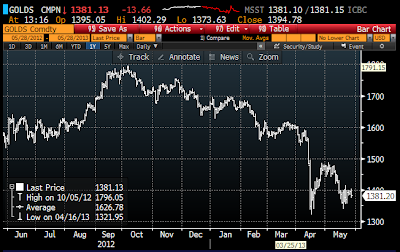 As the above chart shows, gold prices have dropped rather precipitously since early April. Declining gold prices likely reflect reduced concerns about the inflationary potential of monetary policy, and they could also reflect reduced concerns about the possibility of another recession or economic collapse. Gold, in other words, is consistent with the message of nominal and real yields. The chart above shows the difference between the nominal yield on 5-yr Treasuries and the real yield on 5-yr TIPS, otherwise known as the market's expected annual inflation rate over the next 5 years. Expected inflation has fallen by about 50 bps since early April, and most of that decline can be explained by a rise in real yields, since nominal yields are up only 25 bps or so. To summarize, there have been big changes in the bond market in recent months that point to 1) improving expectations for real economic growth, and 2) somewhat lower inflation expectations. 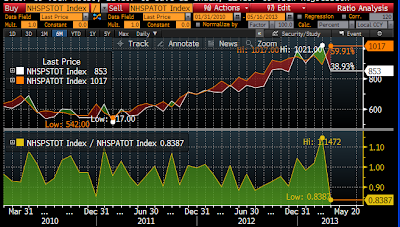 Both of these, in turn, are consistent with the 7% rise in the S&P 500 since early April. These are all healthy developments. Perhaps more importantly, these changes are NOT consistent with the view that the equity market is being pumped up by easy money. 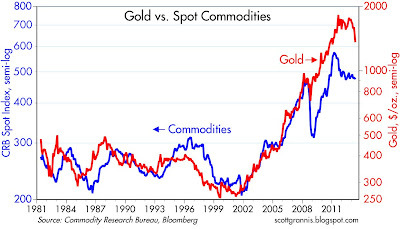 If easy money were the driving force, we would be seeing higher gold prices and lower real yields. A variety of surveys show that housing prices on average rose 10-14% in the year ended last March. Nominal housing prices are now at a post-recession high, after being relatively flat for the past four years. 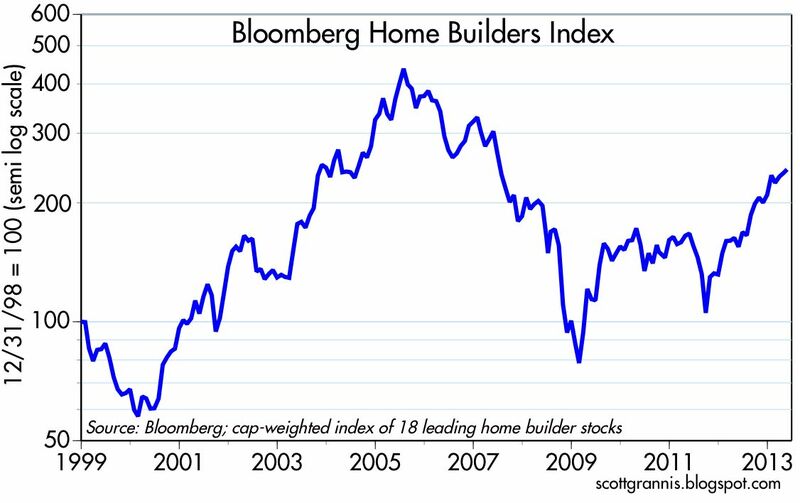 Over the same period, an index of the stocks of major home builders has risen 245%, housing starts are up 78%, and residential building permits have almost doubled. The conclusion is obvious: the housing market recovery is real and robust. Adjusted for inflation, housing prices fell over 40% from their early-2006 high to their early-2012 low, according to this measure of prices in 20 major metropolitan markets. That's a huge downward adjustment—by far the biggest in modern times—but it was necessary to clear the a very large excess housing inventory. The chart above covers a longer time span, but only 10 major metropolitan markets. The decline in inflation-adjusted housing prices from 2006 to 2012 was almost identical to the decline in the prior chart. Prices today are about 17% higher in inflation-adjusted terms than they were in 1989. However, 30-yr fixed mortgage rates were over 9% back then, whereas they are only 3.75% today. 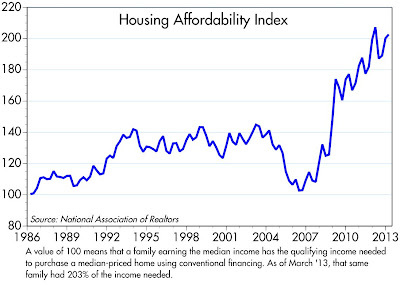 Thus, the monthly cost of buying the same house today is about 60% less than it was in 1989. 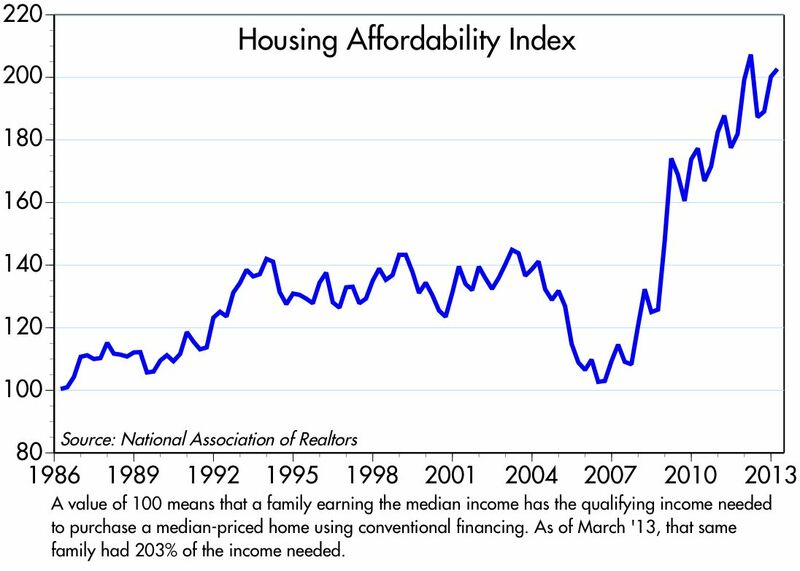 Housing has never been more affordable for the average family than it is today, as shown in the second chart above. 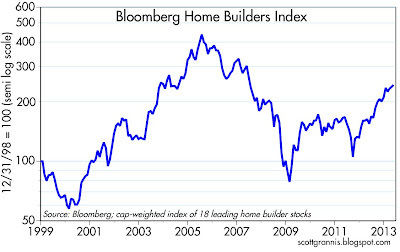 Home builders' stock prices are up 245% from their recession-era lows, as the above chart shows. 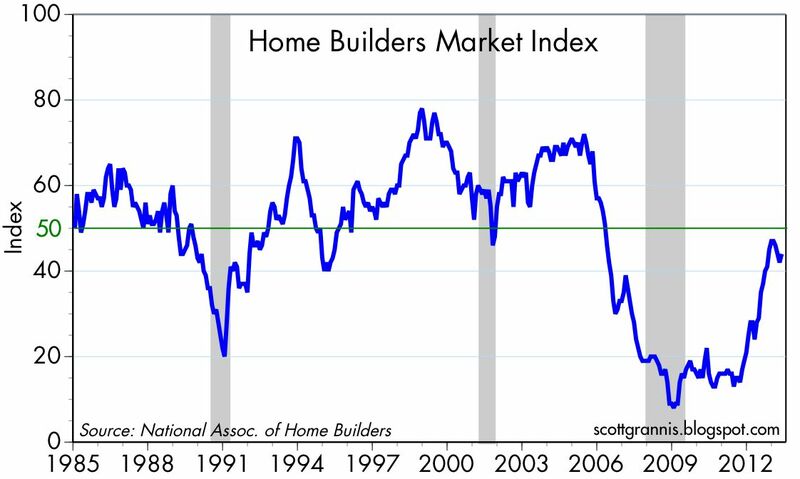 This index of homebuilders' market sentiment (builder perceptions of current single-family home sales and sales expectations for the next six months) has improved dramatically over the past year or so, but it is still under 50, the point at which just as many builders rate conditions as "good" as do "poor." In other words, even though there has been a dramatic improvement in the housing market, there is no sign of excessive optimism among major home builders. 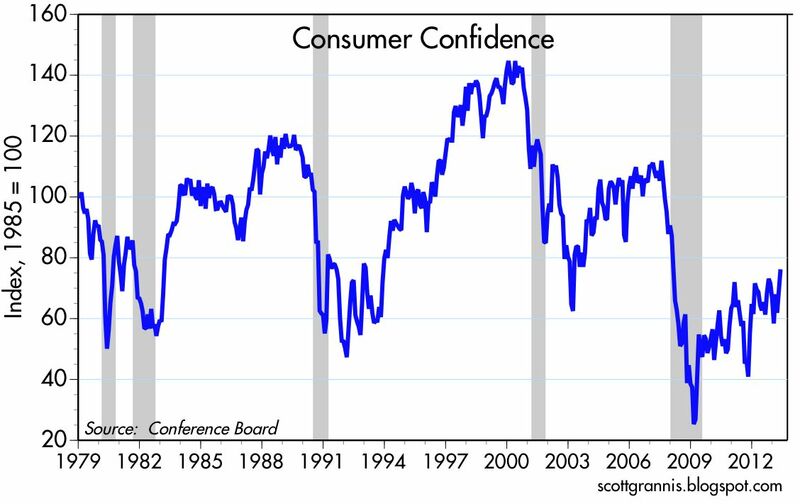 Consumer confidence has likewise improved dramatically from its recession lows, but confidence is still at levels that were consistent with prior recessions. We are still far from reaching conditions which might be considered "optimistic." Skepticism and caution are still widespread, and that means that there is plenty of room for the housing market to improve in coming years. 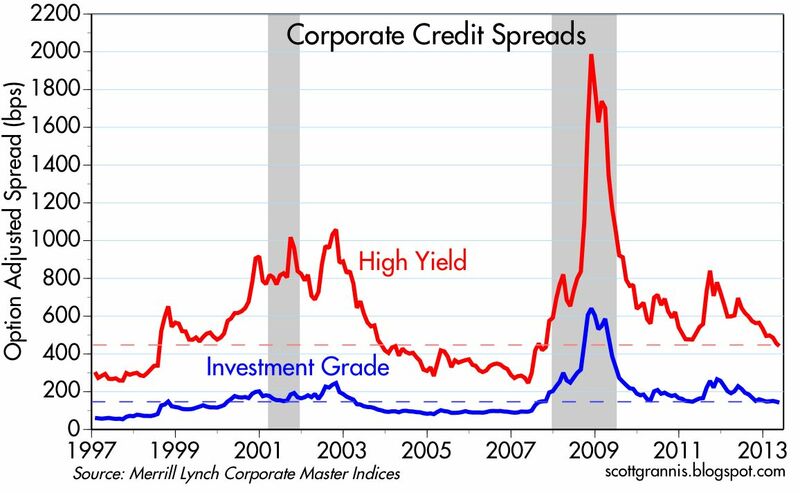 Corporate credit spreads today are at post-recession lows, which makes them much less attractive than they were four years ago. However, they are still above the levels that prevailed during the strong growth phases of the previous two business cycles. Spreads are thus only moderately attractive. Investment grades spreads offer only a modest cushion against an increase in Treasury yields, while high-yield spreads offer substantially more. Bear in mind that Treasury yields are likely to rise only to the degree that the economy and/or nominal GDP picks up, and in either case that would reduce the risk of defaults, thus providing a further cushion against higher Treasury yields. 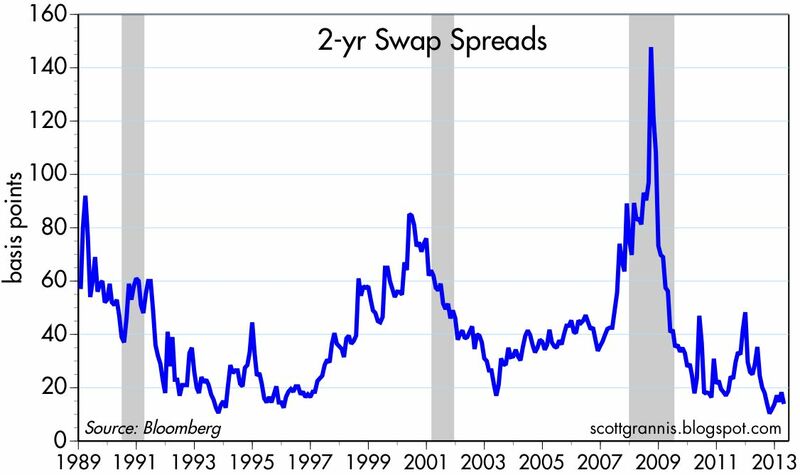 UPDATE: I think spreads at this level reflect a market that has lost a good deal of its pessimism, but is not necessarily optimistic or overly optimistic. High-yield spreads are still 200 bps above the lows of early 2007, when the economy was growing at a reasonable pace and the future looked OK, and the subprime mortgage crisis was still in its infancy. Investment grade spreads are only 60 bps above the 2007 lows. Russell Redenbaugh, a good friend of mine for the past 20 years or so, has been a great source of inspiration. He has triumphed over great adversity—losing his sight and the normal use of his hands—to become a successful investor, a world champion at jiu jitsu, and an influential voice in conservative political circles. I struggled with the loss of my hearing about 10 years ago, but that's nothing compared to what Russell has managed to accomplish. I consider him to be one of the smartest analysts and investors I know, and I feel privileged to have collaborated with him over the years. In this video from a recent TED conference, he tells his story in 18 minutes. A month ago, capital goods orders were looking disappointing. Today's release of April figures, which included a 2.5% upward revision to prior numbers and beat expectations (+1.2% vs. +0.5%), has returned this series to the "moderate growth" column. 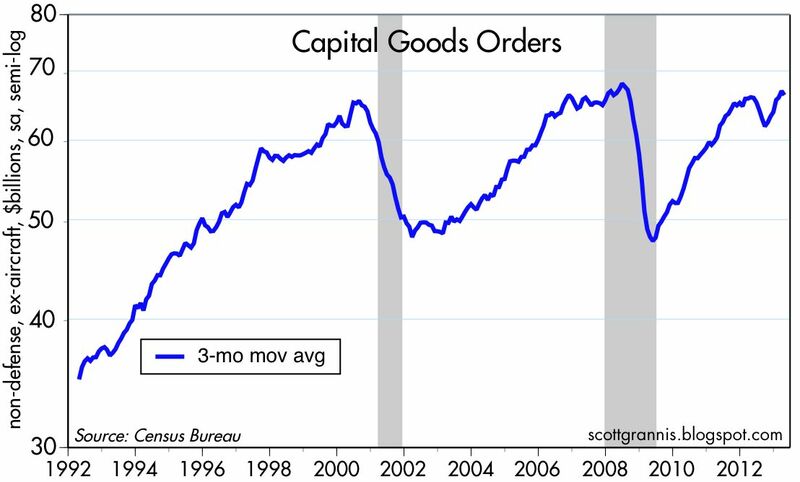 Capex orders are now up 2.6% over the past year, after fully recovering from a disturbing slump last summer. This is encouraging, to be sure, but we will need to see better numbers than this if the economy is to do better than plod along at the 2% growth rate that has prevailed over the past few years. Businesses still remain quite cautious, and one need look no further than the significant uncertainties surrounding the impending implementation of Obamacare to understand at least in part why. Nevertheless, the "recovery" in this series provides good support for the view that the economy continues to grow and that a recession is nowhere to be found. That is a critical point, since yields remain extraordinarily low from an historical perspective, and consistent with rather dismal growth expectations. If we could be confident that the economy could post 2% or better growth for the foreseeable future, yields would likely be substantially higher than they are today, since the Fed would almost surely have abandoned its zero interest rate policy stance. I can't help but note the media's bias which is exemplified by a Bloomberg article that implies that Apple has avoided taxes by "shifting income ... to offshore tax havens." Given that Apple has fully complied with all applicable laws, why should anyone presume that corporations have a duty or an obligation to maximize their tax liability? Corporations' duty is first and foremost to maximize shareholder profit. Without profit corporations cannot exist. If corporations fail to maximize their profit they are wasting scarce resources. Are financial journalists ignorant of the fact that the incidence of corporate taxes falls almost entirely on consumers? The bulk of any tax on corporate profits must eventually be passed on to consumers in the form of higher prices, since corporations must earn a minimum return on equity in order to remain in business. Corporations benefit society most by adding value to scarce resources and satisfying consumer demands, not by paying taxes. Are politicians and journalists arguing that we would all be better off if the government took a much larger share of Apple's profits? Show me one example in which the government utilizes scarce resources more efficiently than Apple and I might agree that Apple should pay higher taxes. But I am quite comfortable believing that Apple can more efficiently utilize scarce resources than the government, and that therefore Apple's tax burden should be as low as possible in order to advance the common good. Apple has amply demonstrated the absurdity of our tax code by borrowing $17 billion to avoid paying taxes twice on money it has earned overseas. Apple is essentially engaging in an arbitrage in which it will pay less than 2% a year in order to avoid paying 35% on any overseas profits it might otherwise repatriate. When such a huge arbitrage exists (otherwise known as a "wedge" to economists) it is a sign of markets and regulatory structures that are seriously dysfunctional and inefficient. This is a compelling argument for reforming our tax code and sharply reducing the corporate tax rate. At the very least, the U.S. corporate tax rate should be no higher than it is in majority of the countries in which our businesses compete, and we should never impose a tax on money that has already been taxed in another jurisdiction. Corporations should be indifferent to repatriating money earned overseas; they should never be penalized for doing so. In an ideal world, the corporate tax rate should be zero and there should be no deductions. If Tim Cook made any mistake in his testimony earlier this week, it was in being overly generous in suggesting a compromise in which the corporate tax rate would fall to 20%. If there must be a compromise, then tax reform should employ a static-revenue-approach in which a lowering of the corporate tax rate is offset by the elimination of deductions. I'd like to think that Apple came out ahead in this congressional battle, if only because it has logic on its side. I'd also like to think that this has been very instructive for the electorate, and that it has therefore advanced the cause of tax reform. Early last week I argued that the beginning of the end of QE3 was not scary, even though the Fed could start scaling back its asset purchases within a few months. Yesterday the Fed moved closer to doing just that, and it sent paroxysms of fear rippling through global equity markets. As I see it, this is simply an overreaction. 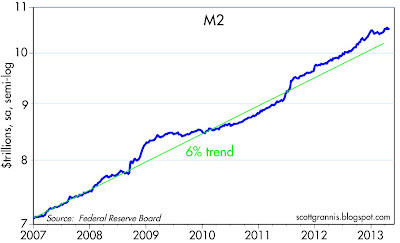 The economy is not about to collapse just because the Fed buys fewer Treasuries and MBS. The Fed is going to be scaling back QE in response to an improvement in the economic outlook and there's nothing scary about that at all. Reading the bond market tea leaves shows that bond market is rationally reflecting an improvement in the economic outlook, rather than any deterioration. 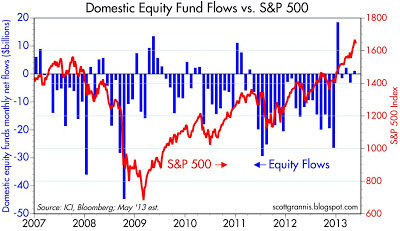 This in turn suggests that the equity market selloff is overdone. The chart above illustrates the biggest change to hit the bond market of late: a sharp rise in 5-yr real yields on TIPS. 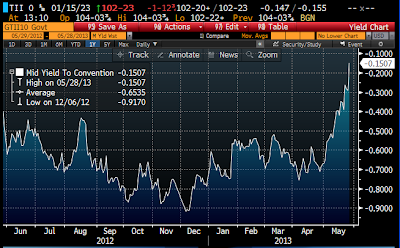 Since the beginning of April, 5-yr TIPS real yields are up over 70 bps, and that's a big deal. 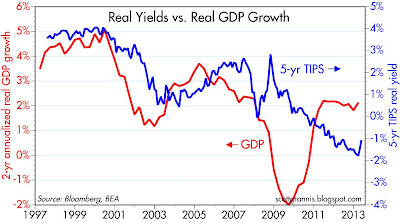 The chart above compares the real yield on 5-yr TIPS to the 2-yr annualized real growth of the U.S. economy since 1997. As I've argued before, real yields on TIPS tend to track the market's expectations for economic growth. Real yields in the past two years have been negative because the market has been extremely concerned over the possibility of zero or negative growth going forward. It only makes sense to buy TIPS with a negative yield—thus assuring a loss of purchasing power—if you are really concerned that returns on risky assets could be much worse. The recent rise in real yields tells me that the bond market has now become less pessimistic about the prospects for U.S. economic growth, and that same change in sentiment can be found in Fed governors' recent statements. 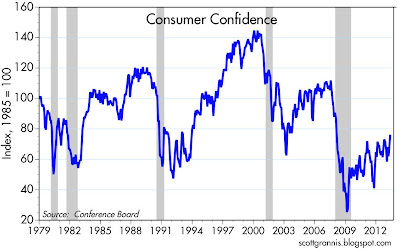 We aren't seeing more optimism, we are seeing less pessimism. The risk of bad things happening has declined, so it is less imperative for the Fed to continue its asset purchases. 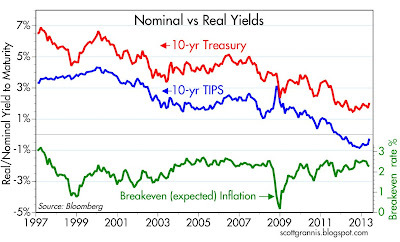 The above chart shows 5-yr nominal yields on Treasuries and 5-yr real yields on TIPS, as well as the spread between the two—which is equivalent to the market's expected average annual inflation rate over the next 5 years. Real yields have risen much more than nominal yields, which have barely budged, and that is the result of declining inflation expectations, which are now down to just under 2%, only slightly below the 2.08% average of the past 16 years. Nothing scary at all here: inflation expectations have moderated a bit, and concerns over future economic growth have also moderated a bit. 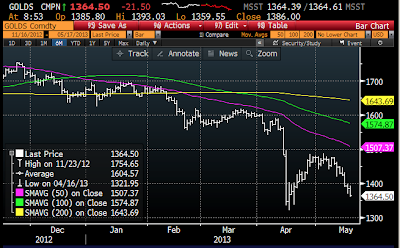 That change in sentiment can also be what's driving gold prices down from exceptionally high levels. As the above chart shows, long-term inflation expectations have also moderated a bit, but they remain absolutely normal at 2.3%, considering that the annualized increase in the CPI over the past 10 years has been 2.4%. Nothing scary here: inflation expectations remain "well-anchored," as the Fed is wont to say, and there is no sign of deflation concerns either. 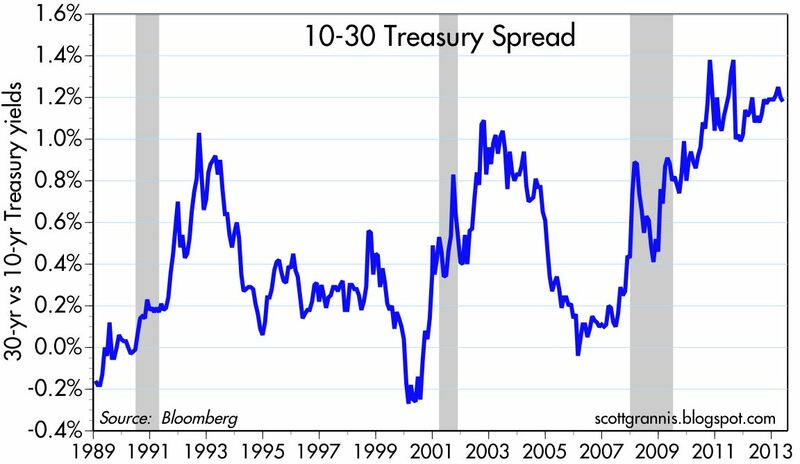 The above chart of the spread between 10- and 30-yr Treasury yields is a good measure of the slope of the yield curve, which remains just about as steep as it has ever been. A steep yield curve is a classic sign of a market that expects short-term interest rates to rise in the future, and as a corollary, a sign that the market considers the Fed's current monetary stance to be very accommodative (easy money today almost guarantees that monetary policy will have to tighten in the future). If the bond market were worried that Fed tightening could threaten the economy, then the yield curve would be a whole lot flatter. 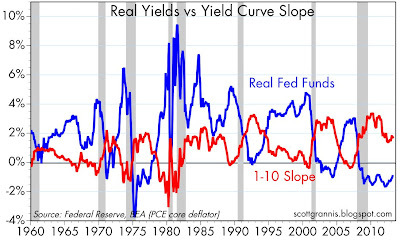 By the way, the above chart also shows that the Fed's efforts to flatten the yield curve have not succeeded at all. As I explained last week, when a central bank's massive bond purchases produce a counter-intuitive result, that is a very good sign that monetary ease is working. 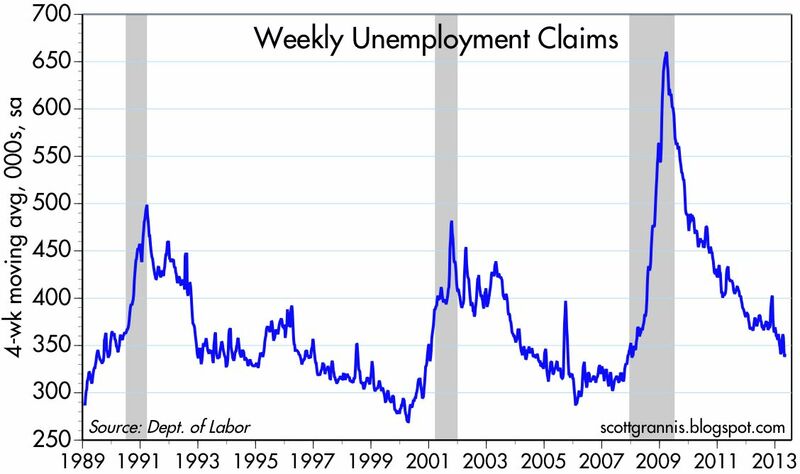 Meanwhile, high-frequency data such as weekly claims for unemployment continue to be consistent with an economy that is growing. Nothing to worry about here. 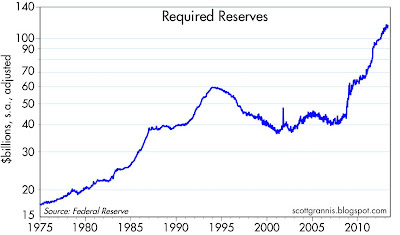 As the above chart of bank reserves shows, the magnitude of the Fed's latest round of asset purchases has been quite modest compared to what it was with QE1 and QE2. Tapering its purchases beginning in a few months will be equivalent to the Fed adding fewer drops to a relatively full bucket. 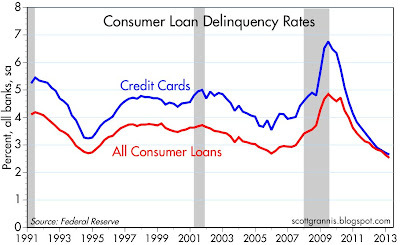 Delinquency rates on consumer loans and credit cards fell to a new all-time low in the first quarter of this year. 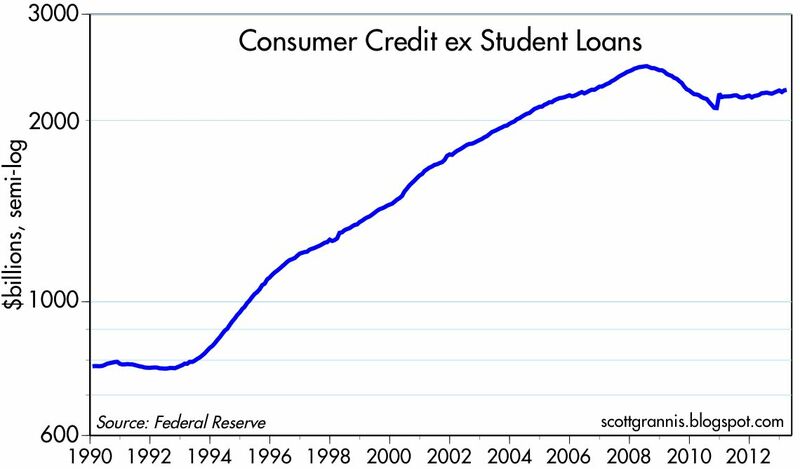 Abstracting from student loans, which are growing at a (frightening) 20%+ annual rate and now make up some 20% of all consumer credit, banks have not aggressively expanded their consumer lending activities, as shown in the chart above. This presumably owes much to tighter lending standards and to consumers' desire to deleverage. But there has not been a wholesale curtailment of consumer lending that might explain declining delinquency rates. Falling delinquency rates thus are most likely a sign of improving consumer finances, prudent lending standards, and greater job stability. 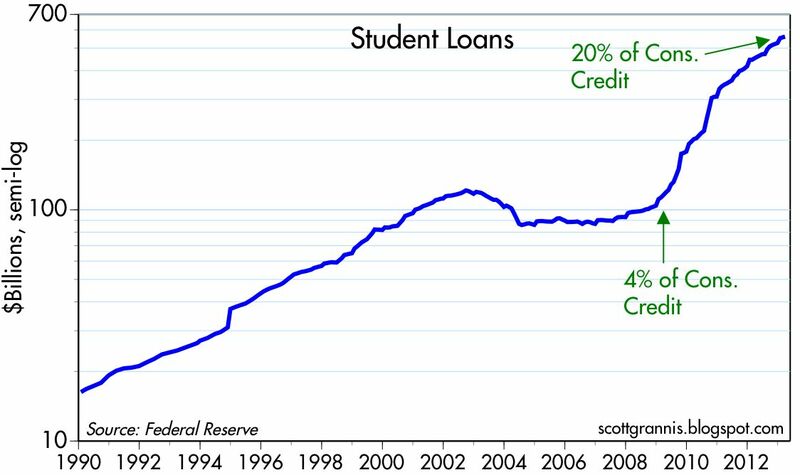 If there is anything to worry about, it is the still-rapid expansion of student loans that began in early 2009 when the federal government essentially took over the student loan market. The other day I helped my daughter apply for a $20,000 student loan and it took her about 5 minutes online to qualify. Surprisingly easy. Probably too easy for most, and a likely source of future problems. With easy access to federally-provided credit, students are enabling colleges to continue charging what in many cases are exorbitant amounts. 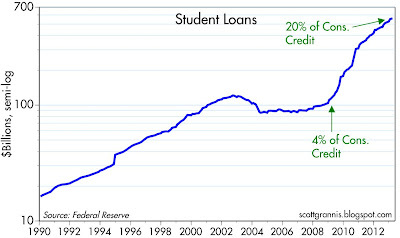 Watch out for the seemingly-inevitable bursting of the higher education bubble. 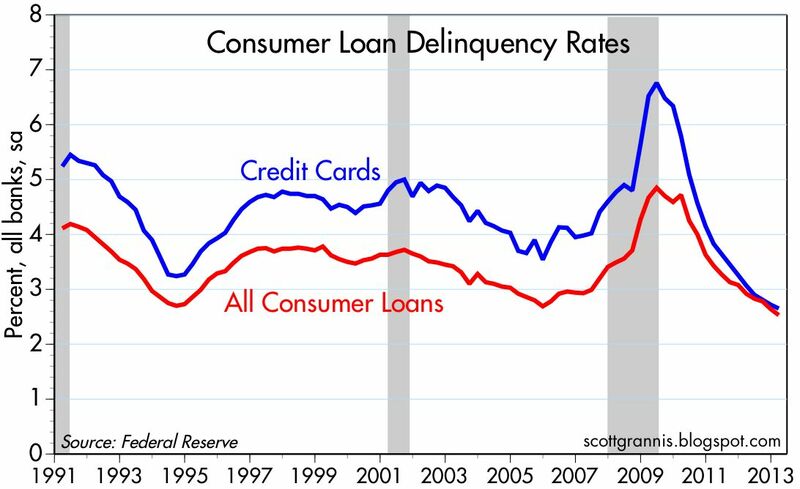 In the meantime, declining consumer delinquency rates are a healthy sign. 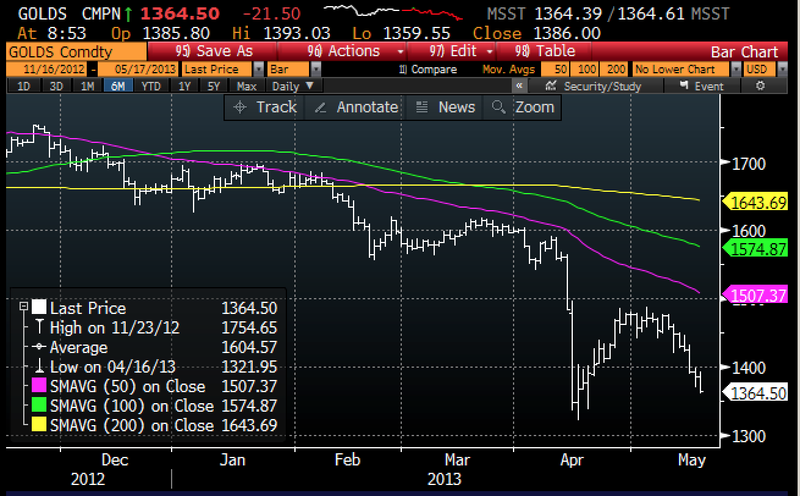 As the top chart shows, gold's brief recovery now looks more and more like a "dead cat bounce." Further weakness is likely in store, as the second chart suggests. 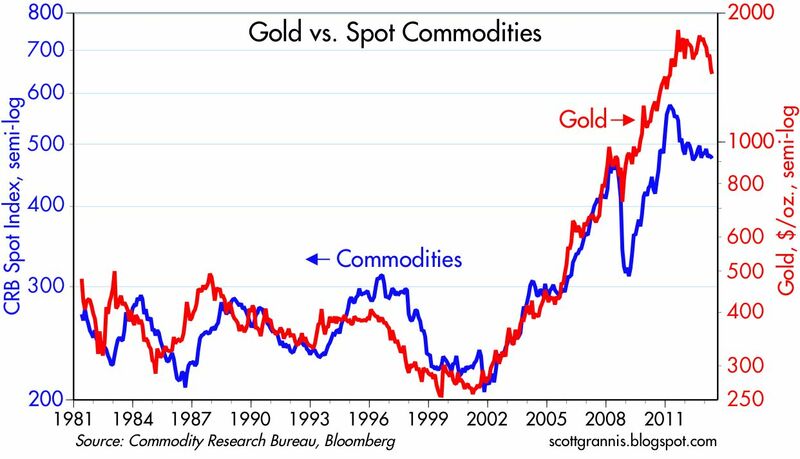 As I mentioned last month, gold appears to be re-linking to commodities. This is a big deal, as the chart above suggests. 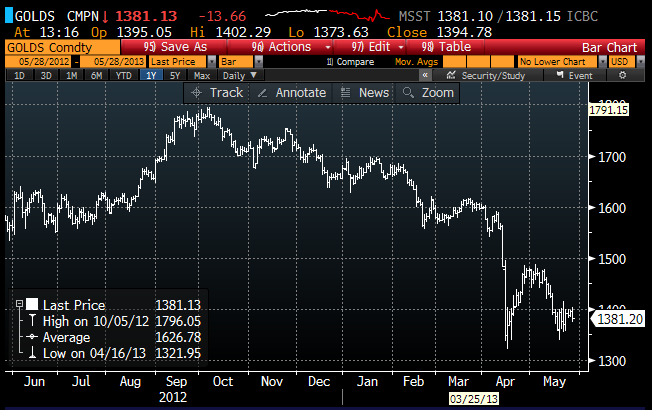 Gold had been trouncing just about everything for 10 years or so, but now things are reversing. 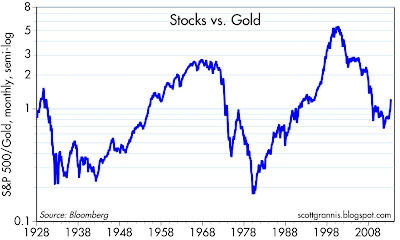 Equities—productive investment—are now in favor while gold—speculative investment—is out of favor. April housing starts were sharply lower than expected (853K vs. 970K), but building permits were much stronger than expected (1017K vs. 941K). 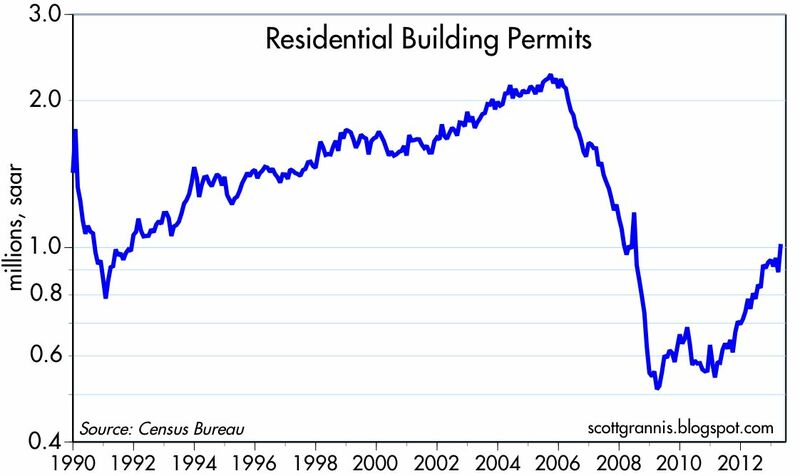 The past behavior of these two series suggests that in cases like this where starts are this low relative to permits, they usually come back into line with permits in the subsequent month. Thus it's reasonable to expect that starts will bounce back next month, and that the boom in residential construction activity is ongoing. Not surprisingly, building permits and housing starts tend to track each other very closely, and it's reasonable to assume that builders must first acquire a permit before starting construction. Logic would thus suggest that the sharp divergence in these two indicators should be resolved in the direction of permits. The above charts show the long-term history of the level of starts and permits and their ratio (on the bottom half of each chart). Note that the ratio averages just about 1 over time, which means that indeed the two series are measure two sides of the same thing: residential construction activity. 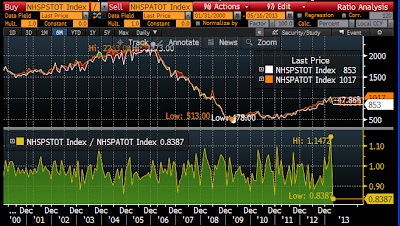 The top chart gives a long-term view, while the bottom chart zooms in on the past several years. Note that April 2013 marked the lowest level of this ratio in the past 13 years. In fact, it was the lowest ratio in the entire history of these two series going back to 1960, and this strongly suggests that April starts were the outlier. 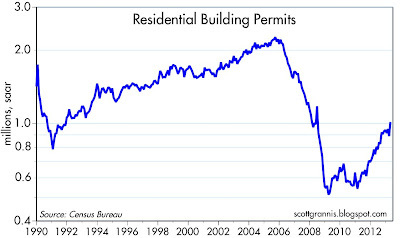 Something similar occurred in December 2010, when permits rose strongly but starts were flat. 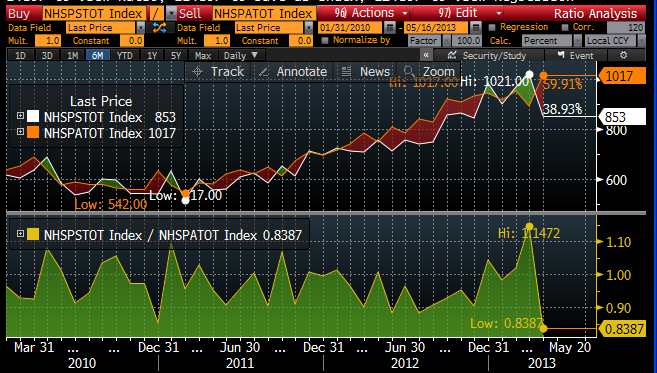 The following month the ratio shot higher as starts surged. 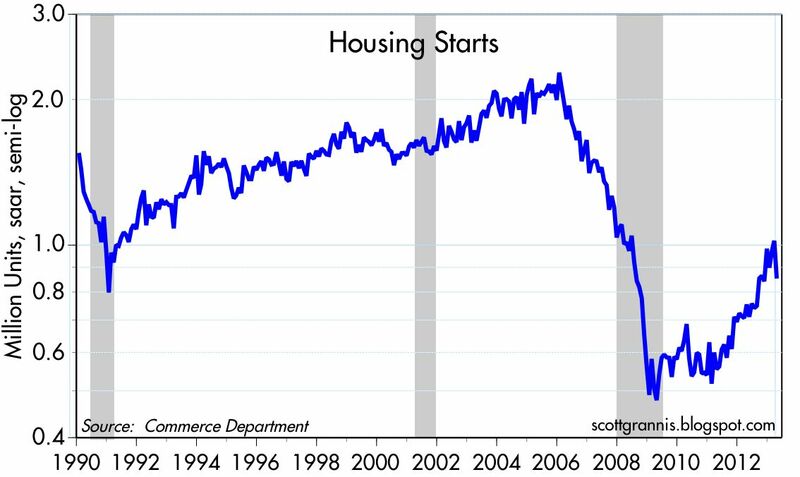 Starts and permits have been rising at about a 30% annual pace for over a year, and there is no reason to think that this boom has suddenly come to an end. 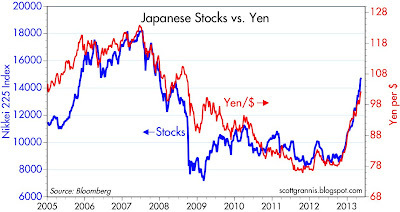 Japan is still the place where the biggest changes are happening on the margin. Stocks are still soaring as the yen falls, and now Japanese bond yields are soaring as well. Quantitative easing in Japan, which involves massive purchases of JGBs, has produced the counter-intuitive result: sharply lower bond prices. That's a good indication that monetary ease is working. 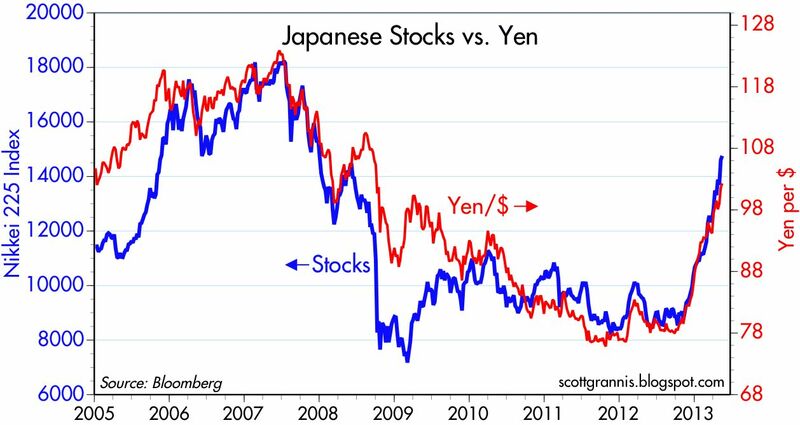 The strong inverse correlation between the yen and the Japanese stock market is a predictable result of monetary stimulus that reverses deflationary pressures that had been generated by the yen's relentless climb against all other currencies. In short, to be effective, monetary stimulus must achieve the opposite of its stated goal, which is to reduce interest rates. Rising interest rates go hand in hand with stronger growth and rising inflation expectations. The same scenario, but to a lesser degree, is now playing out in the U.S. As the above chart of 10-yr Treasury yields shows, yields are now higher than they were when the Fed announced its QE3 program in September, and when they increased the size of monthly purchases last December. Yields are up despite concerted buying by the Fed because the market is raising its expectations of U.S. growth. This is also a good illustration of my long-held view that the Fed cannot artificially manipulate interest rates. Treasury yields have been very low not because of Fed bond purchases, but because the market was very pessimistic about the prospects for economic growth. Rates are now moving higher despite ongoing Fed purchases because the market is adjusting upwards its expectations for growth. 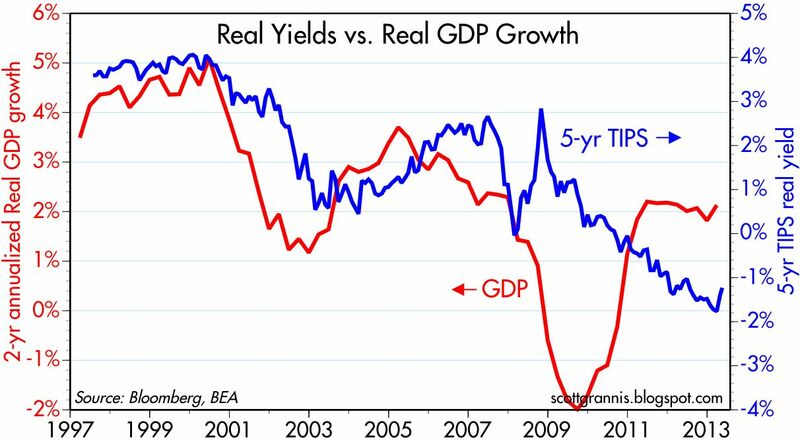 The above chart attempts to show how real yields on TIPS tend to track the underlying growth potential of the U.S. economy. When the economy was booming in the late 1990s, TIPS real yields were about 4%. But in recent years economic growth has moderated significantly, and real yields have fallen. The recent increase in 5-yr TIPS yields doesn't look like much in this chart, but it has been on the order of almost 60 bps, and that is significant. Despite the recent increase, the current level of TIPS yields is still consistent, I think, with a market that holds little hope for any meaningful economic growth in the years to come. With the publication over the weekend of a story by John Hilsenrath discussing the Fed's plans for exiting Quantitative Easing, it is clear that the time is rapidly approaching when the Fed will begin scaling back its monthly purchases of Treasuries and MBS. Once new purchases cease, the next step will be for the Fed to reduce its holdings of Treasuries and MBS, and at some point in this process, short-term interest rates will almost certainly begin to rise. The only thing newsworthy about this is that the unwinding of QE might start a bit earlier than the market has been expecting. In fact, the Fed could well start scaling back its purchases within a few months. So how scary is this? It's very scary if you believe that the Fed's aggressive expansion of its balance sheet has been the main force sustaining and powering the recovery. Without continuing injections of tens of billions of bank reserves each month, how can the recovery continue, and won't higher interest rates threaten the recovery? 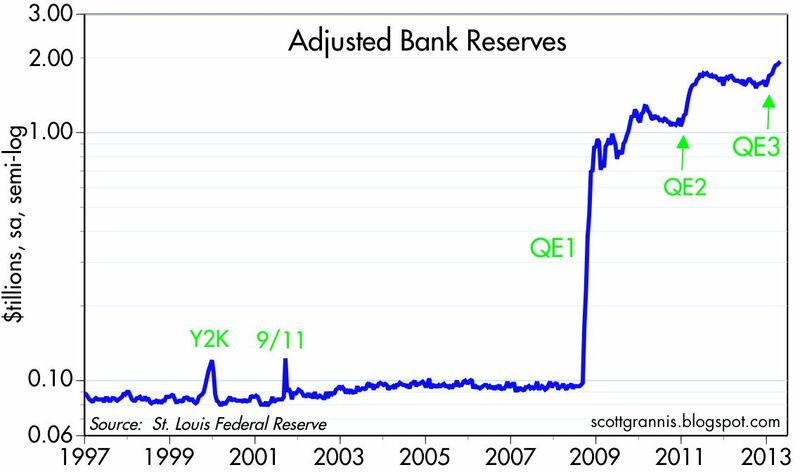 It's not scary at all if you believe, like I do, that the primary goal of QE was not to "print money" or stimulate the economy, but rather to satisfy the world's apparently insatiable appetite for safe-haven, risk-free assets. 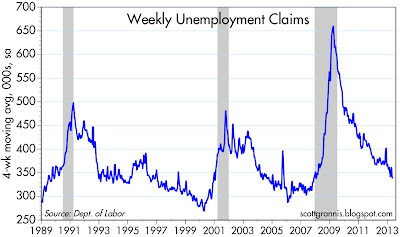 It's not unreasonable to think that now, after four years of recovery, with over 6 million jobs created, with industrial production having staged an almost-complete recovery, with housing starts and auto sales growing at double-digit rates, and with global equity market capitalization only 8% shy of its 2007 all-time high, the demand for risk-free assets is beginning to taper off. If the world is now beginning to feel more comfortable with the fact that economic and financial conditions have improved, and thus the risk of another collapse has receded, then it would be entirely appropriate for the Fed to begin tapering its balance sheet expansion, simply because there is no longer a need for it. It's not scary if you realize that higher interest rates typically accompany a recovering economy. Higher interest rates only become a threat to growth after at least a few years of aggressive Fed tightening—when real interest rates approach 3-4% and the yield curve becomes inverted. We are still many years away from conditions such as these. The Fed is likely to get really tight only if the economy and/or inflation start to really boom. It's also not scary if you realize that the end of Quantitative Easing means the end of an unprecedented experiment in monetary policy that held the potential for dramatically increasing inflation and undermining the value of the dollar—and that was thus a major source of uncertainty. The unwinding of QE means the beginning of the end of a major source of risk-stifling uncertainty, not a new source of uncertainty. It's just plain old good news. Maybe that's why the market today reacted to the news with equanimity. I've explained in detail here how the Fed's purchases of Treasuries and MBS were not the equivalent of printing money; how they were instead the equivalent of swapping newly-created, risk-free T-bills for more risky notes and bonds; and how banks have been quite content to hold on to virtually all the extra reserves the Fed has created in the process. 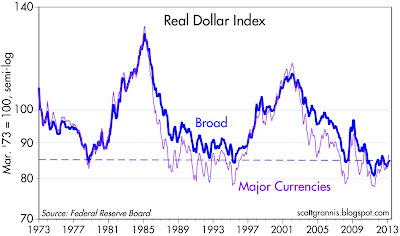 As I show in the charts that follow, there is no evidence in the money supply numbers of any unusual growth, and there is no evidence of unusual dollar weakness. 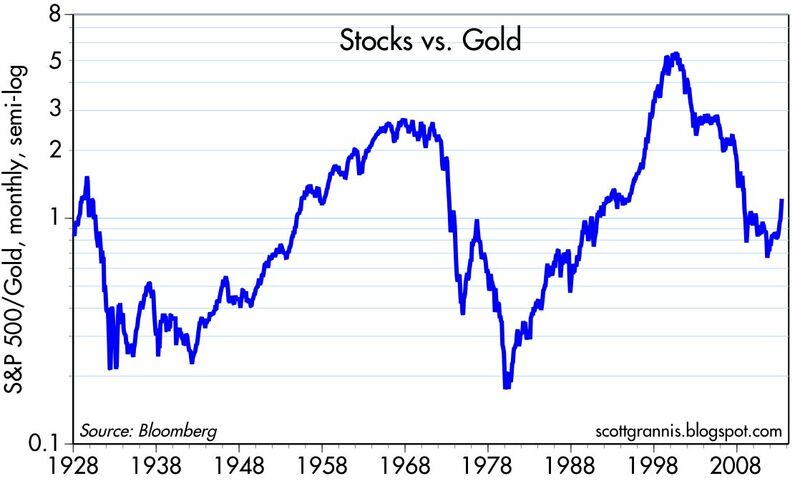 Gold's recent decline and the relatively flat performance of commodities are more evidence that QE has not been an exercise in massive money-printing. 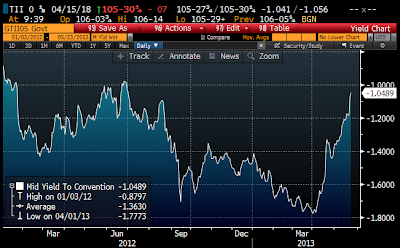 Moreover, short- and long-term inflation expectations remain quite normal. The chart above shows that Fed tightening has been the source of all the recessions since the late 1950s. Tightening shows up as a rise in the real Fed funds rate, and in an inversion of the Treasury yield curve. 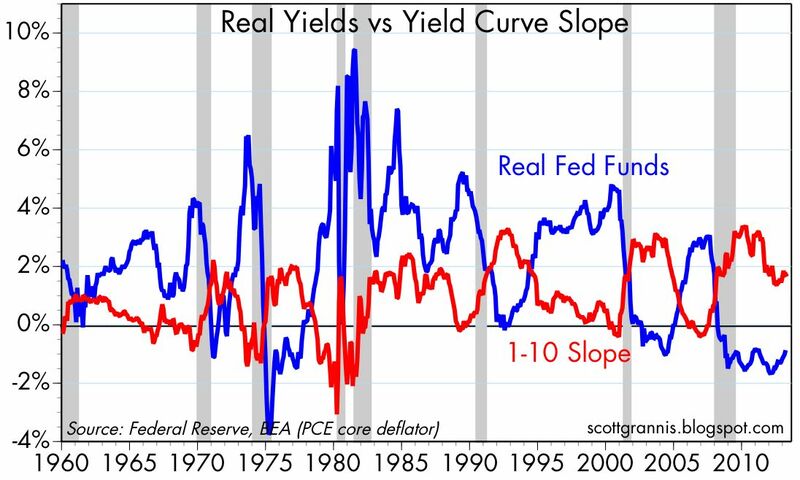 Currently, the real Fed funds rate is still negative, and the yield curve is still quite positively sloped. 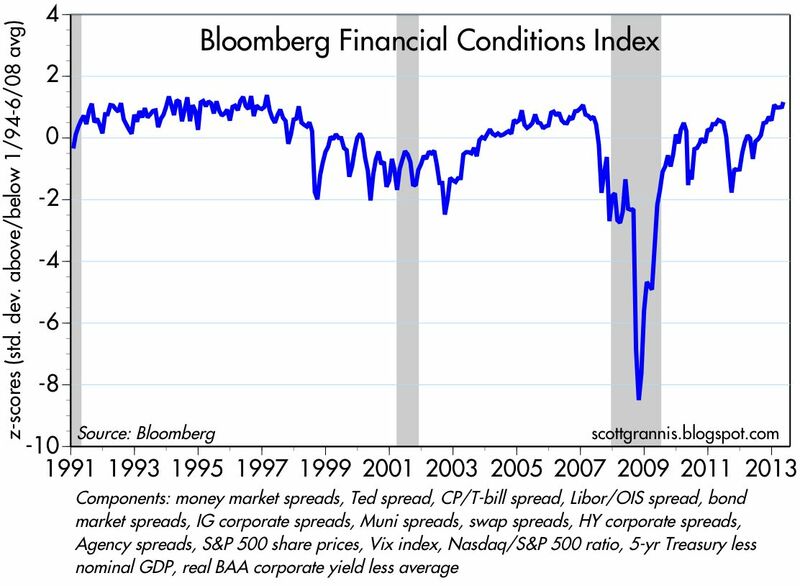 Monetary conditions are easy, and extremely unlikely to lead to a recession. 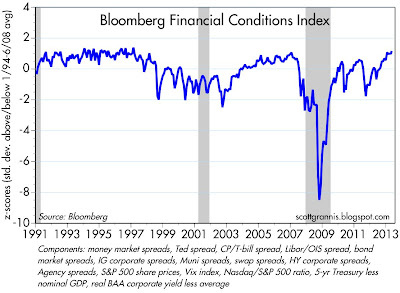 Financial conditions are about as good as they get. No sign in the above chart of any financial stresses or deterioration. Swap spreads have traditionally been excellent coincident and leading indicators of financial market and economic health. Absolutely no sign here of any unusual systemic risk. Liquidity conditions are excellent. It would highly unusual for there to be any near-term economic deterioration given the current health of financial markets. 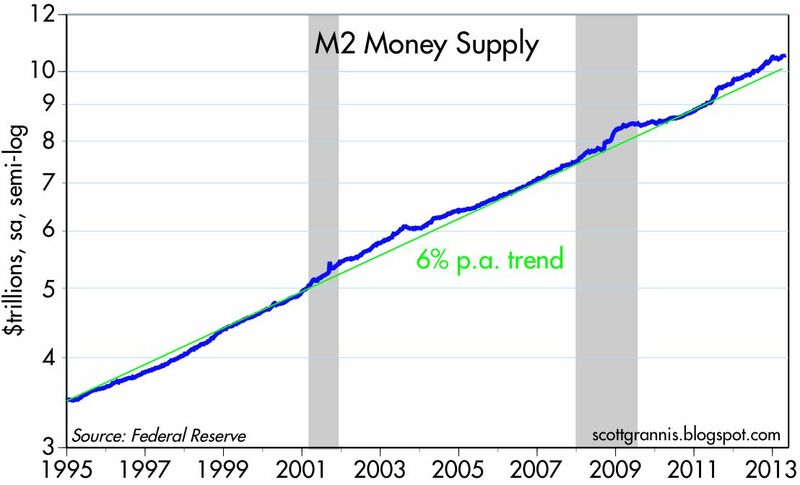 M2, arguably the best measure of the money supply, is growing only slightly faster than it has grown for the past 18 years. 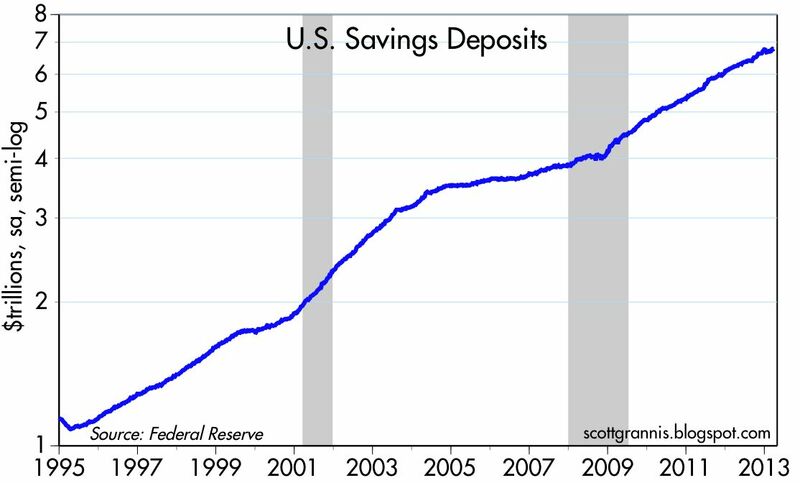 Faster M2 growth is most likely a sign of increased money demand, since the lion's share of M2 growth has been in bank savings deposits, a classic refuge of safety in times of uncertainty. Faster money growth that is driven by rising money demand is not the kind of money growth that creates inflation. We would have to see a significant decline in money demand for inflation to rise, and so far there is no sign of that. 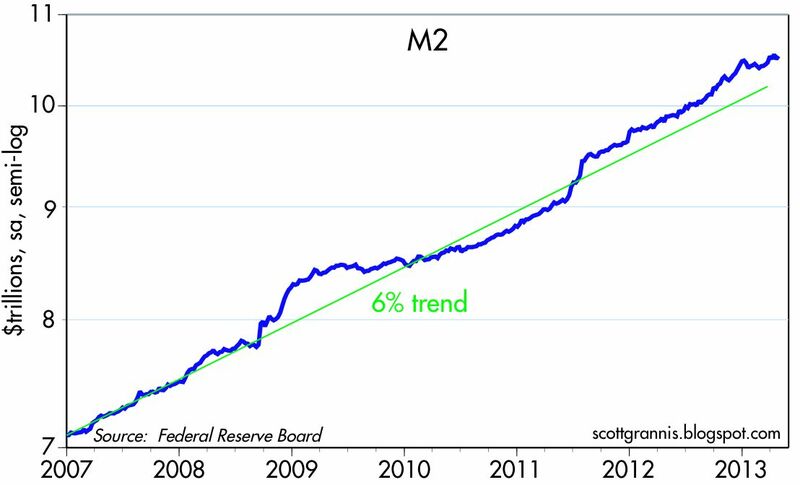 To date, the Fed has injected over $1.8 trillion of bank reserves into the banking system as a result of its purchases of Treasuries and MBS. Of this amount, only $115.8 billion are "required" to back up the deposits of the banking system. That means that banks have been willing to accumulate over $1.7 trillion of reserves on their balance sheets, earning only 0.25%. Why? Because banks are unwilling to lend more and many people and many businesses are still reluctant to borrow and many are still trying to deleverage. 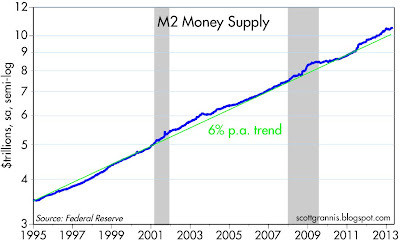 There clearly has been no excessive lending taking place, and thus no unusual growth in the money supply. Banks see reserves as substitutes for T-bills: as safe assets with which to bolster their balance sheets in times of uncertainty. This may well change in the future, of course, and the Fed will need to withdraw reserves in a timely fashion lest they be used by banks to engage in a wild, free-for-all lending spree. Gold and commodity prices can be very sensitive to monetary excesses and shortages. Both declined in the years leading up to 2002, a time when the Fed was demonstrably tight. 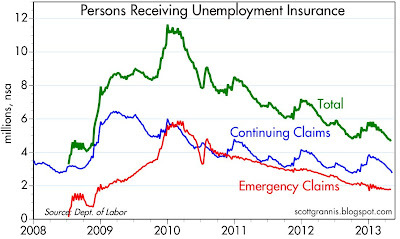 Both rose in the wake of the Fed's dramatic attempts to ease policy from 2003 through 2007. Both fell as the financial crisis of 2008 unfolded, as the world's demand for safe money rose precipitously but the Fed was slow to react. Both rose from 2009 on, as the world began to fear that Quantitative Easing would unleash tremendous inflation pressures. Both have been flat to down in the past year or so, as it has become increasingly evident that monetary policy has not produced the much-feared results. 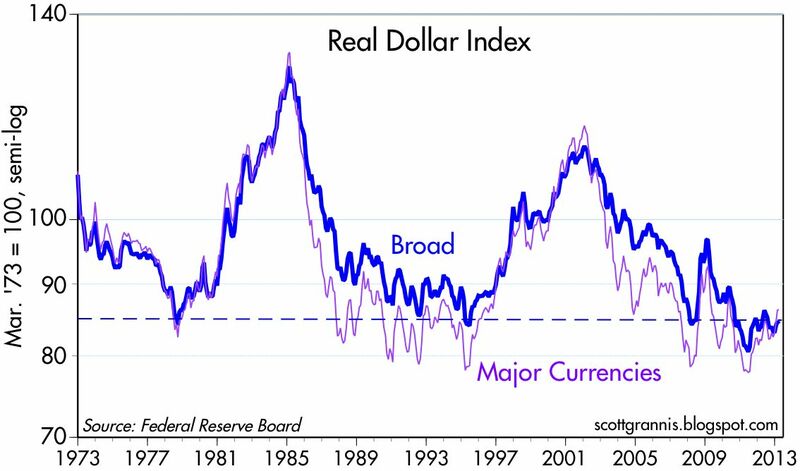 It's not surprising that the dollar is quite weak from an historical perspective, given the Fed's overtly accommodative policy and the disappointingly slow U.S. recovery. 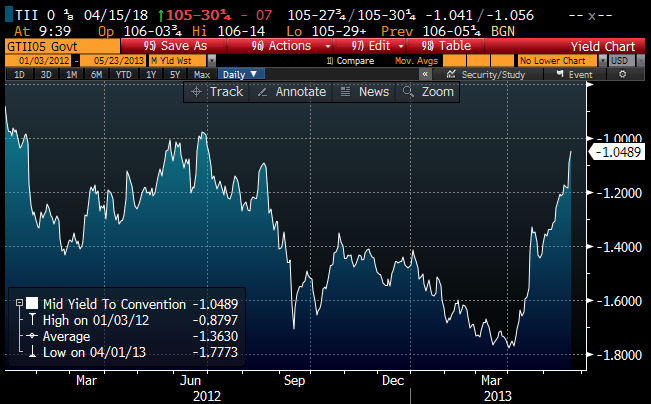 But the dollar is not collapsing, and it has actually strengthened a bit over the past year or so. No sign here of any unusual excess of dollars in the world. The first of the above two charts shows 5-yr nominal and real yields and their difference, which is the market's expectation for the consumer price index over the next 5 years. The second chart shows the same relationship for 10-yr yields. 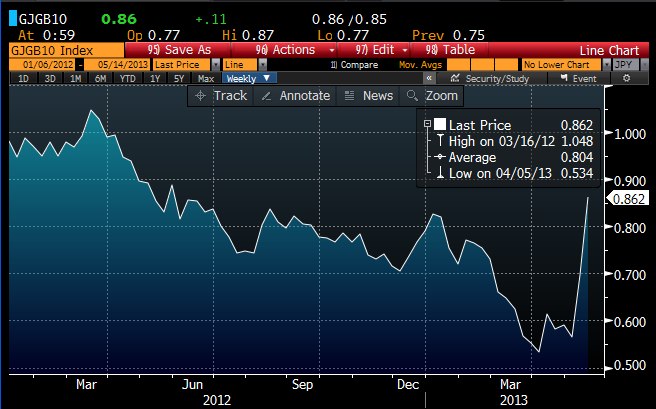 Both show that inflation expectations remain "firmly anchored" as the Fed is wont to say. All things considered, there is nothing very scary going on. The only thing to be worried about is that the Fed fails to reverse QE in a timely fashion, since that could unleash a tidal wave of inflation. In the meantime, it's a good thing that the Fed seems to want to accelerate the reversal of QE.